*This page takes into consideration that you have already registered for a Mealtime account and have access to your children's accounts. The home page of the Mealtime portal will highlight the first account name in the list. It will provide information about the cafeteria account balance and the transaction history near the right margin of the screen. This same view provides a green button labeled Add $. Clicking the green button will bring you to another screen that will allow you to make a payment that will satisfy the cafeteria portion only. You are then given the option to finalize the transaction or continue shopping. 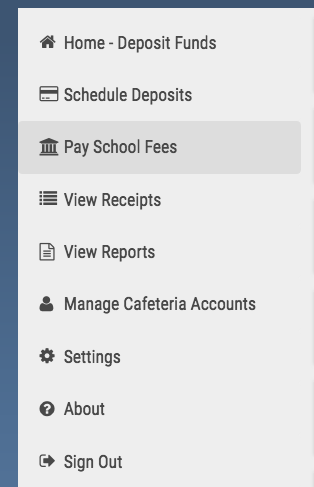 If you wish to make a payment towards high school athletics then once logged into the mealtime portal, click the 3rd item down on the left side of the screen labeled "Pay School Fees"
On the right side of the screen will be a listing of High School athletic team fees. Find the team that your child will be participating with and click on any of the whitespace area. Please Note! 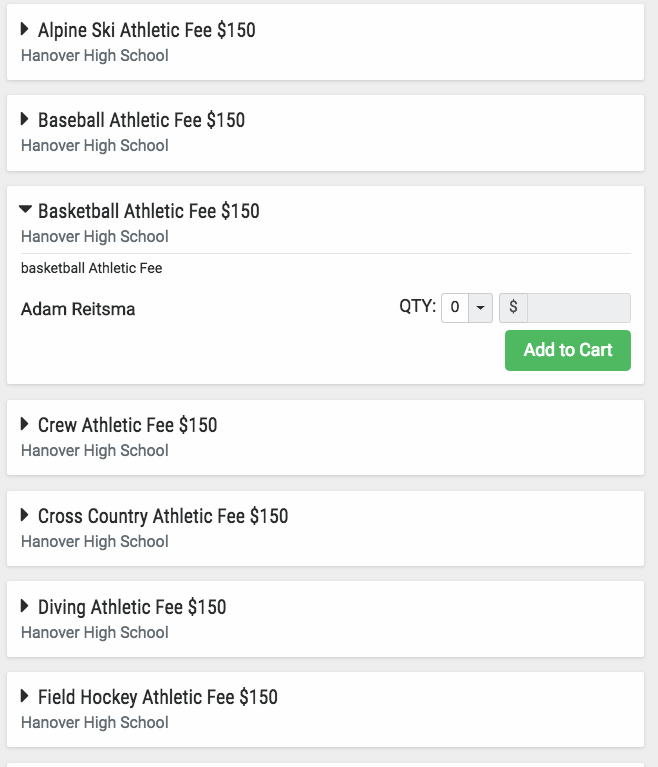 If multiple children are playing the same sport such as basketball or ice hockey, when you click on the whitespace of the team fee to display, the next set of options you will notice that the children's names will be listed and you can add to the cart payments for all children participating in that sport. When you make the change to quantity 1 the fee amount will be applied. You may now click the green button "Add to Cart"
Repeat the process for any other teams that need payment. Once finished your cart icon in the upper right corner should have a notification of how many transactions are waiting to be processed. Click on the cart to see the transaction summary. You can now finalize payment and complete the transaction.